​At Tracy Animal Hospital, we pride ourselves on providing unparalleled customer service & patient care. We know that our patients are our greatest treasures, and we treat them that way! We also want to thank our clients for putting their trust in us, and for sharing their experience with others. The Dr's and staff are beyond wonderful. The care they all give my babies is truly heart warming to me. Thanks so much. April 2019 - Pat C.
Dr. Tracy is the best! I have been using Tracy Animal Hospital for over 15 years for all of my dogs. Dr. Tracy Sr treated several of my dogs their whole lives and now his son - Dr Tanner Tracy treats the dogs I have now. Both he and his dad did two knee surgeries on my big boy Wyatt and did a wonderful job! Wyatt is now strong as a horse. He also treated a stray we rescued for heart worms and she is now healthy and happy. And both him and his dad just did a surgery on Sadie Grace - my healer mix who had Luxating Patella and she is doing great. The whole staff is wonderful - kind and caring of their patients. I would highly recommend them and would never take my fur babies anywhere else! January 8, 2018 - Bob W.
A few weeks ago my wife and I found a frightened and hurt little dog outside our back gate. Not knowing what to do, I called Kim at Tracy's for advise. She told me that she would call me back. To my surprise, Kim, Ashley, and Tanner showed up within 15 minutes to care for the lost and hurt little dog! I can't even get my family doctor to make a house call! They did a quick exam and transported the dog back to their clinic for treatment. The owner called me later that night. She was THRILLED that her dog had been found, but confused that a local vet had taken such an interest in caring for her loyal pooch. The world tends to make us suspicious of a good deed, doesn't it? I assured her that the people at Tracy were exceptional people who loved animals. I gave her the number and address for Tracy Animal Hospital. She showed up the next morning and according to Kim, there wasn't any doubt that they knew each other. A happy ending doesn't come around a lot, but thanks to the staff at Tracy Animal Hospital, this one ended on a happy note. 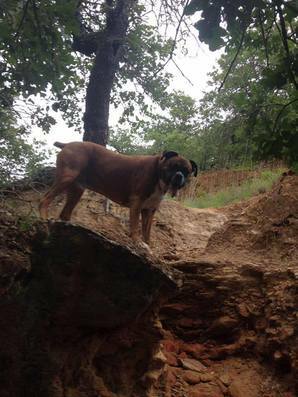 October 30, 2018 - Bob W.
We took our Boxer, Leonidas (Leo), to Dr. Rusty Tracy and Dr. Tanner Tracy nearly all of his 10 1/2 year life. The vets and technicians saw to his yearly visits and two surgeries and were competent and compassionate. The wait times were minimal - at most just a few minutes, if that - and the staff is very friendly, helpful and informative. We have just rescued another Boxer and will now take him to Tracy Animal Hospital, also. I feel fortunate to have found such a good vet clinic and would highly recommend the these guys! We have used Tracy Animal Hospital for at least 15 years; now with second generation Dr. Tracy. They are caring and very professional. After moving a bit further away, we continue to take our pups to Tracy. We also board our dogs then traveling and very pleased with the care they receive when away from home. Grateful to Dr Tracy for his Jan 2012 surgery and treatment of our battered rescue beagle. Every January I think of how much Dr Tracy helped this poor dog after it was hit by a car and abandoned. Six years later, our beagle Lily continues to prosper and live a happy life because of Dr Tracy’s involvement and care. My family and I have come here for years. These are the best guys around!! 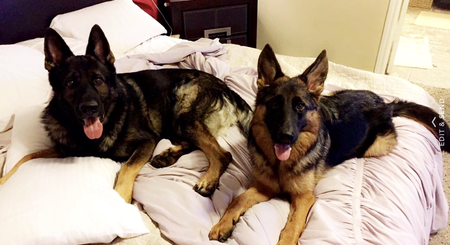 Jan 1, 2018 - Brittany N.
They are super nice and treat my 4 dogs like their own. We have been going to Dr. Tracy for our personal dogs for 20 years! He and his staff are absolutely the best. When I got into rescue he also gave his time and money to help some of the worst cases he has ever seen. He is honest and truly cares about the animals. I wouldn't go anywhere else. The staff is very friendly and they treat my pet gently. I appreciate this as my Coco is in her 13th year. I have been a client for years now, since my dogs were puppies when I first brought them home. We have had numerous problems come up with my girls (i.e., ear infections, structural issues, hip dysplasia, etc.) over their lives (they are 5 years old now) and every step of the way all of the staff here have been wonderful. When one dog started to walk strangely they did x-rays and diagnosed hip dysplasia, and told me the cruciate ligament was probably coming (which it did, just weeks later). But no worries! They gave me a realistic prognosis, repaired the ligament (it works even better than before it tore now) and have always been available for my questions and prescriptions. I have never had a bad experience here and I always make sure to suggest them to others looking for an honest, reliable, knowledgeable veterinarian. Thank you so much, Drs. Tracy and the fantastic clinic staff!